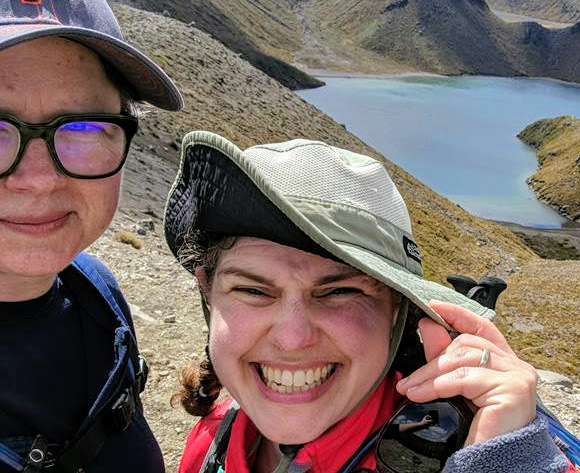 When lesbian adventure travellers Stephanie and Ziadee contacted us, they’d already planned a lot of their 9 day trip around New Zealand. They only wanted help with two days when Ziadee would be on her own while Stephanie jetted off to Australia to catch a concert. “You’re going to Australia overnight to see a band, while you’re touring New Zealand?” I clarified. “Yes, it’s my all-time favourite band,” Stephanie explained, “I need to know Ziadee is well taken care of in New Zealand on her own while I’m gone,” she added. “And I’m feeling a little guilty ditching her to go to Australia for two days on our vacation,” she fessed up. This was a first for us! Their fights were booked, as well as 4 night’s lodgings. 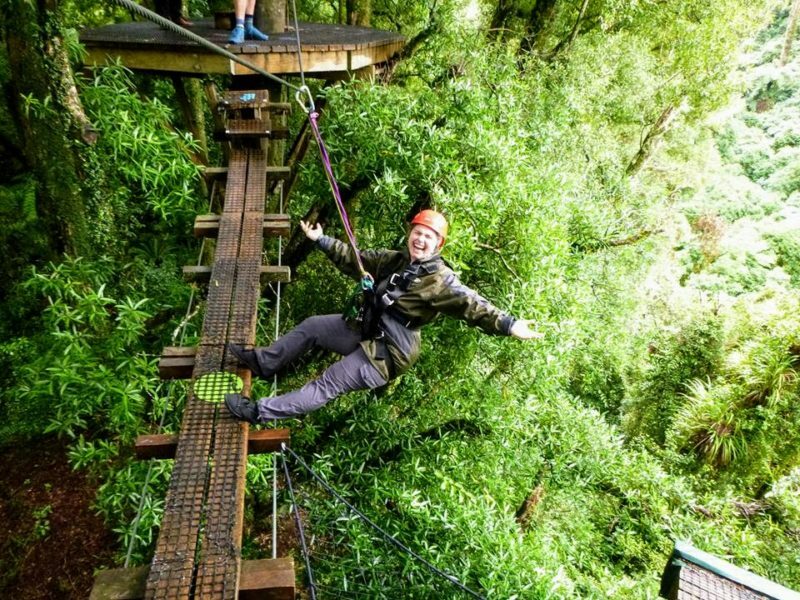 And their list of ‘NZMustDo’ included hiking, swimming, kayaking, white water sledging, glowworm caving, bird watching, and wineries – impressive, to say the least. 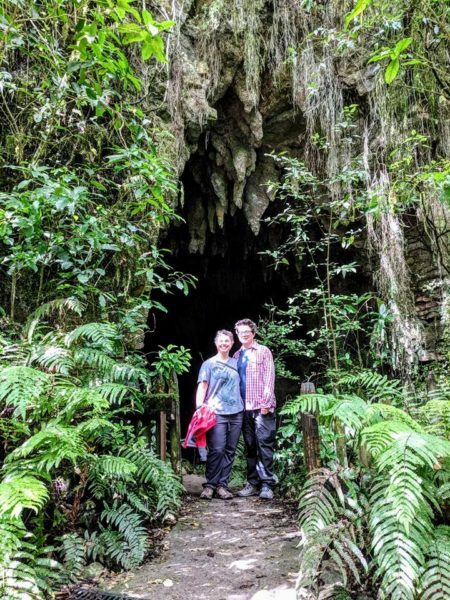 They also wanted to explore only our North Island – very cool! With so much on offer in the North Island, we were excited to work with them. Like many independent adventurous travellers, their research on New Zealand was extensive, and they’d created an excellent itinerary. Although knowing our roads and travel time, I was more than a little concerned that they’d be too busy every day to really enjoy themselves. 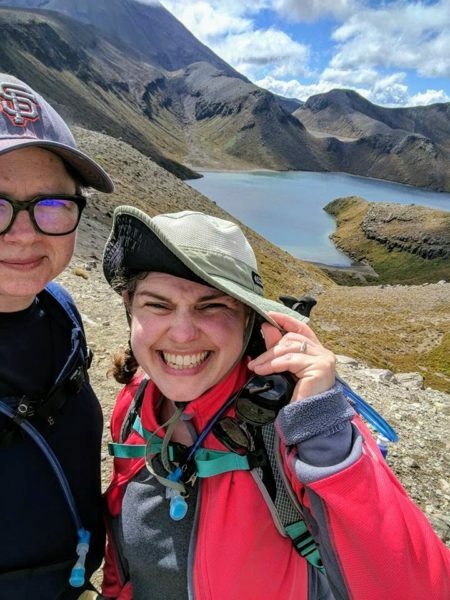 If you’re a lesbian adventure traveller yourself, take a look at their trip and see what you think. For Stephanie and Ziadee, it was perfect. Well almost… more on that below. 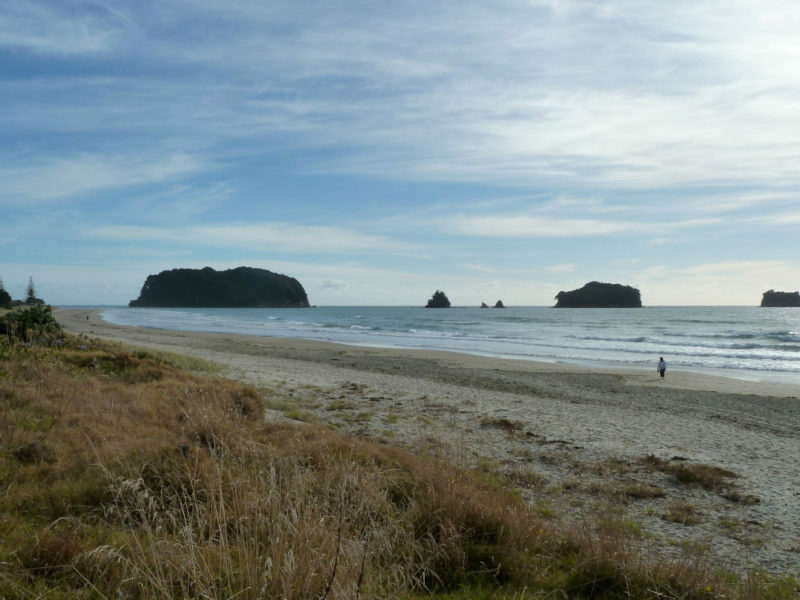 On arrival in Auckland, they grabbed their rental car and headed to to Cook’s Beach on the Coromandel Peninsula. They’d hardly been in the country half an hour when they texted to say their kayaking trip at Cathedral Cove the next day had been cancelled due to high seas that wouldn’t be settled in time. ”We don’t care it’s raining and windy, we still want to get out on the water tomorrow,” they texted. I wasn’t surprised. While most on the Coromandel hunkered down in this weather, these two wanted to get out and feel the full force of nature. I worked on an alternative while they spent the afternoon swimming at Flaxmill Bay and exploring the Shakespeare Cliff trail. With raging seas and no chance of kayaking gorgeous Cathedral Cove, Stephanie and Ziadee drove south, to my absolute favourite Coromandel beach, Whangamata. I grew up going to this beach as a kid, and still holiday there now. With 5 miles of white sand beach, a tranquil harbour, and a gentle estuary and tidal river, Whangamata offers all weather paddling that the other Coro beaches can’t beat. It’s also not highly touristed yet, which adds to its appeal. With the winds at their backs, Stephanie and Ziadee had an invigorating kayak and SUP up the Otahu Estuary enjoying the rural views. They said their fantastic guide Pete, from our partners SurfSup, made the trip even better. Sipping local wine and munching on Italian appetizers at Mercury Bay Estate Vineyard to end their day, they kicked back and drank in the amazing views over Cooks Beach. Stephanie and Ziadee had planned to hike today, but after letting them know their chosen hike (the 6 hour Pinnacles Track near Thames) was closed for maintenance, we switched things around. They travelled from the Coro Peninsula through to Waihi to bike into the Karangahake Gorge. We booked them onto the most interesting and scenic section that meanders along the river and through the gorge. 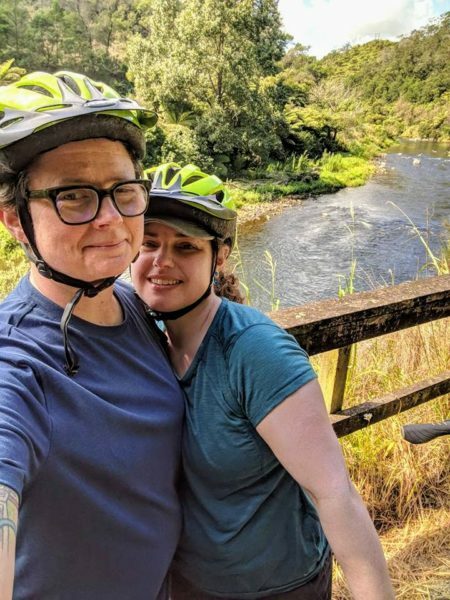 While many choose to bike in one direction, an out and back from Waihi offers a more flexible relaxed ride with no shuttles to meet, and the option of a unique steam train ride for the return if you’re feeling pooped! 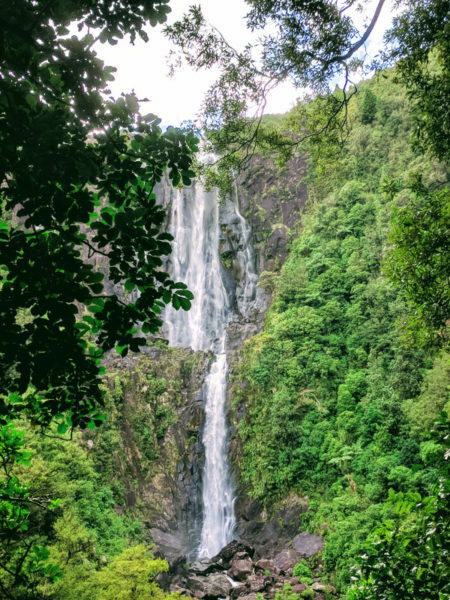 Knowing Stephanie and Ziadee wanted a good climb with views, our alternative hike to the Pinnacles was the Wairere Falls in the Kaimai Ranges. With a stunning waterfall and great views over the plains of the Waikato, this shorter hike is a fantastic option. Their nearby lodging was also tucked away in a town very few tourists visit, Te Aroha, ‘Mountain of Love’ in Maori. Appropriate for these lovers! A stroll across the parking lot from the lodging takes you to the Te Aroha mineral spas – perfect for an evening relaxation after hiking the falls. Ziadee to Rotorua, Steph to Aussie! With Stephanie jetting off to Australia for the night, Ziadee made the most of her time alone. She jumped on a local shuttle service and headed south to Rotorua. 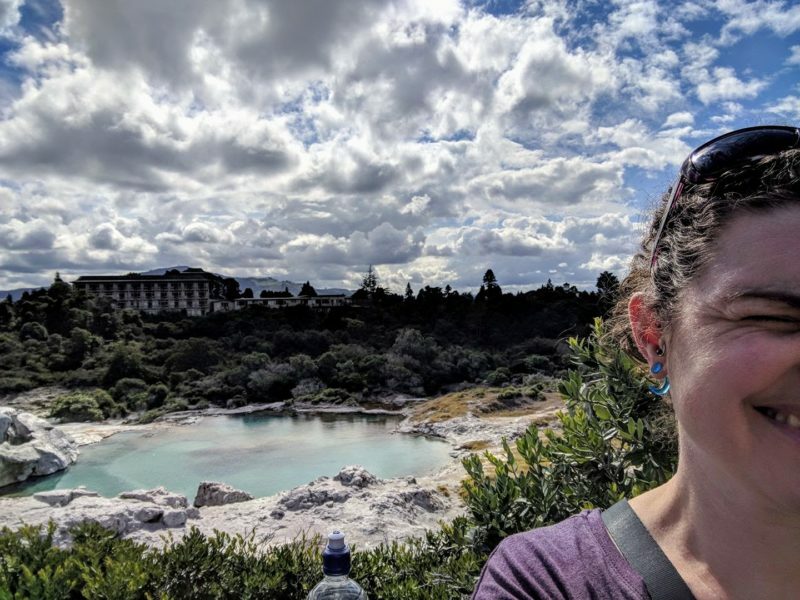 Te Puia, with its bubbling mud pools, steaming fumaroles, Pohutu geyser, and the New Zealand Maori Arts and Crafts Institute, is easy to spent few hours wandering, as Ziadee did. The schools of carving, weaving, and other traditional arts are open to visitors and you can watch and chat with the students learning the crafts of their culture. Literally around the corner is The Redwoods – Whakarewarewa Forest, a 5600 hectare forest with walking and mountain biking trails. Hiking amidst these magnificent giant redwoods is just the ticket to stretch your legs if needed. Ziadee’s hotel for the night was a quick 5 minute walk to Rotorua’s Eat Street – filled with numerous restaurants and bars where the choices are endless. 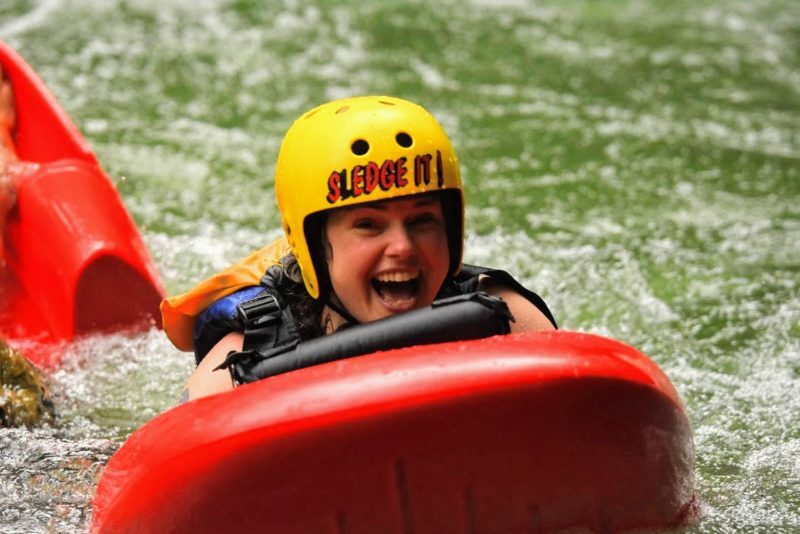 While Stephanie, sleep deprived and exhausted, boarded a plane in Sydney, Ziadee was whizzing her way over white water rapids in New Zealand’s lush native bush. Yeah, this rocks! After a quick bite for lunch, Ziadee was off to meet some of our most passionate conservationists who combine adventure and conservation in one exciting native bush* ziplining experience. (*yes, we do call our forest ‘bush’). Ziadee listed this experience as one of her top three highlights in New Zealand. Meanwhile Stephanie was driving from Auckland airport to pick Ziadee up in Rotorua and continue through to Tongariro. The less than perfect part of their trip was this drive. As Ziadee wrote to me after the trip, “Our pace worked well for us except Saturday night – Steph’s travel plans back from Auckland were a bit too ambitious. We both got cranky driving to Tongariro and missed seeing Taupo in the dark!” Ah well.. the band was still worth it, right Steph? Everyone wants to hike the Tongariro Crossing. It’s commonly referred to as ‘the best one day walk in New Zealand’. However, like many iconic experiences around the world, with every man and his donkey doing them, it’s not necessarily the experience many want anymore. I’d warned Steph and Ziadee that it would be crowded. I’d talked with their lodging host about alternatives prior to their arrival since they only had one day to do it, and the weather can often cancel the best laid plans. “Don’t worry”, she assured me, “there are many other walks here just as phenomenal as the crossing and they can be done in all weather.” Well, as it turned out, the weather was fine, but Steph and Ziadee chose to follow the advice of their local host. “SO glad our host knew how crowded Tongariro crossing is…” Ziadee wrote to me after (apparently there were 2000 hikers that day), “…we would have been miserable if we’d done it.” She also added, “And don’t tell EVERYONE about the hike we did – our hosts don’t want that one to get overrun, too.” Don’t worry Ziadee, we promise, we won’t! Steph and Ziadee’s second to last day looped them back from Tongariro to Waitomo, famous for its glowworm caves. There are many cave tours on offer in this area, from 45 minutes to 7 hours, from dry to wet, walking, in a boat, ziplining, rafting… choosing what is best for you can be a challenge. If you appreciate nature, want to get up close and personal with the glowworms, and stay dry, then you’ll want to experience this magical wonder with Spellbound, which is what Steph and Ziadee ultimately chose. Spellbound makes sure you have the time, group size, silence, and a knowledgeable guide, to really appreciate these unique creatures. (If you’re heading to the South Island, talk with us about a great glowworm trip there too). For their last night in New Zealand, Steph and Ziadee wanted to explore our native bush at night. It’s hard to describe what this experience is like. Think Jurassic Park-like primordial rainforest, the sounds of teeming insects, bugs, and nocturnal birds… in darkness so absolute you can’t see your hands. Most New Zealanders have never seen a Kiwi (our native bird, not a New Zealander!) in its natural environment, but Steph and Ziadee had the privilege of spotting one this night. They rated this experience as one of their highlights. Experiencing our native bush at night is one thing, but Steph and Ziadee returned to the eco-sanctuary this morning to hear the morning birdsong and experience the bush in daylight. We’re so proud of Sanctuary Mountain, a world class conservation project on our back doorstep. And we love to share it with our guests. In addition to doing important conservation and restoration work, their vision is to inspire environmental and wildlife conservation in others. We hope Steph and Ziadee returned home inspired. With time to kill before their flight for the U.S. they stopped by Villa Maria vineyards near the airport. It was a perfect end to their adventure-filled, nature focused trip around our North Island. Working with Stephanie and Ziadee was a blast. They know how they travel, their energy levels, and what they want to experience. We know what’s on offer in New Zealand, and the best places and people to do it with. They were really open to listening to our suggestions, tweaks, and ideas for better routes, activities, and new ideas, like the ziplining and sanctuary mountain night tour. It’s exactly how we love to work, helping you make the most of your time and money in our great little country. Stephanie and Ziadee were also awesome in the feedback they gave us after their trip. They gave concrete suggestions that we’re totally incorporating into the next Lesbian adventure trip we plan. Thanks ladies, you rock! 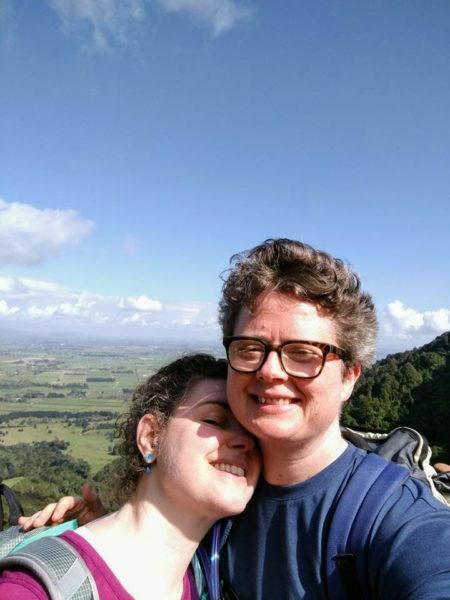 Are you a Lesbian Adventure Traveller? If so, contact us now. We’d love to help you plan an adventure filled trip in New Zealand. This is SO cute! I feel like I know these ladies!! Thanks Joanna, pleased you loved getting to know Steph and Ziadee as much as we did. We feel so lucky to have found Debbie! She steered us away from some serious errors and recommended some of the best highlights of our trip. What a gift not to lose our first day to research to replace our cancelled kayak trip! We recommend her highly and can’t wait to plan a South Island adventure with her help. Thanks so much for this lovely comment Ziadee. Figuring out the best match of activities (and accommodation) for our guests is what we love to do! Can’t wait to create an amazing South Island experience when you’re ready to return!